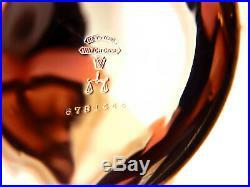 Up for sale is a Mega Rare Beautiful Antique 21Jewels Railroad Elgin Veritas in Original Veritas. The Rare, Unique Movement has a serial number 10860206 which dates it to be manufactured in 1904. The Case is in Excellent Mint condition, the Dial , Hands and Glass Crystals are in immaculate mint condition please see the pictures. 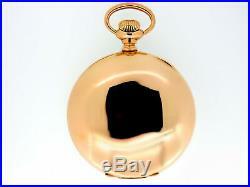 The Watch size is 18 with 21 Ruby Jewels in Raised Solid Gold settings, Solid Gold Train. It’s Stem Wind and Lever set. The watch was recently serviced, running STRONG and keeping an excellent time. Please look closely at the pictures as they part of the description. Thank You and Good Luck!! Brief History: Elgin National Watch Company. The Elgin National Watch Company. In fact, Elgin produced approximately one-half of the total number of better-quality pocket watches manufactured in the United States. Total production over their 100 years of operation reached nearly 60 million watches, which is nearly 50% of ALL the jeweled watches produced by American watch companies! This makes Elgin one of the most commonly collected vintage watches since there are still so many examples available at reasonable prices. The clock tower at the Elgin National. The Elgin National Watch Company was founded in 1864 in Elgin, Illinois as the National Watch Company, and some of the organizers were later to become the some of the biggest names in the American watch industry: J. Currier, Otis Hoyt, and Charles H. Mason, with financial backing from former Chicago Mayor Benjamin W. The factory for the National watch company was completed in 1866, and the first movement produced was an 18-size B. In 1874, the company officially changed their name to the Elgin National Watch Company, and that name remained until they stopped producing watches in the 1960’s. The “Working Man’s” Watch. The Elgin Watch Company’s success was not built on its production of the highest-grade watches, though some of their higher grades were top-quality, exquisitely made timepieces. Their success can be attributed to their huge production of low to mid-grade watches… Together with the Waltham Watch Company, they dominated the huge market for mid-grade watches, producing over one-million per year during their peak years of production. Elgin watches remain extremely popular with collectors today because they are plentiful, can be obtained at reasonable prices, and can be relatively easily repaired due to the large number of watches and parts available. Throughout their history, the Elgin National Watch Company was known for horological innovations. In 1958, they introduced the “DuraBalance, ” an ingenious design for a free-sprung balance (no regulator pins) which used spiral balance arms and small weights to govern the moment of inertia of the balance. 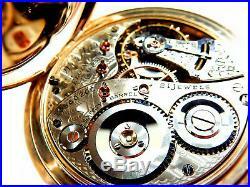 They also produced the only American-made automatic wristwatch movements: grades 607, 618, 760, and 761. These movements featured bi-directional, full-rotor winding, and had two automatic winding gear ratios, which were automatically engaged as the mainspring tension increased. The contributions of the Elgin National Watch Company to American Horological industry cannot be overstated. Many Elgin watches that were made over 100 years ago are still providing reliable and accurate daily service to their proud owners. During the last few years that Elgin was in business (late 50’s through mid-60’s), they began to reduce their US production and began importing Swiss watch movements which were finished and labeled as Elgin watches. Much of this assembly work was done at a new Elgin plant in Elgin, South Carolina. Noon at the Elgin watch factory. 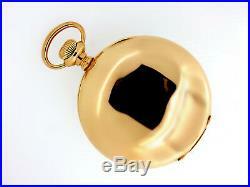 Elgin Watch Cases: Illinois Watch Case Company. 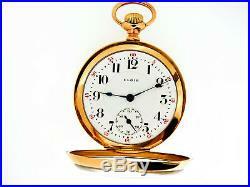 The Illinois Watch Case Company of Elgin, Illinois should not be confused with the Elgin Watch Company. 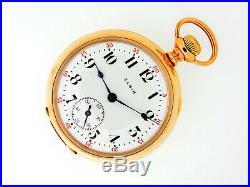 The Illinois Watch Case Company (I. W. C. Co) was a major manufacture in the city of Elgin, Illinois. 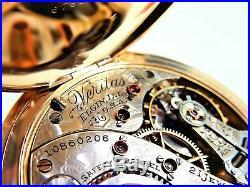 It manufactured watch cases under many brands, such as “Elgin Giant, ” “Elgin Pride, ” “Tivoli, ” “Spartan, ” and Elgin Commander. 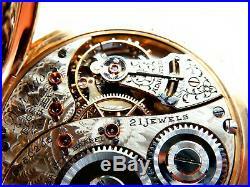 Keep in mind that watch movements and watch cases were usually made by different manufacturers. 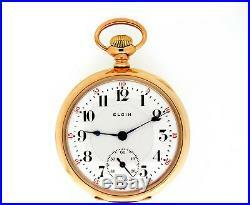 Elgin watches are entirely different than Illinois “Elgin” cases. International Buyers Please Note. 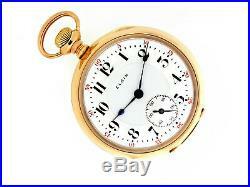 The item “Mega Rare Antique 18s Railroad 21J Elgin Veritas Pocket Watch Original Case Mint” is in sale since Sunday, January 20, 2019. 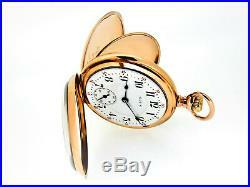 This item is in the category “Jewelry & Watches\Watches, Parts & Accessories\Pocket Watches\Antique”. 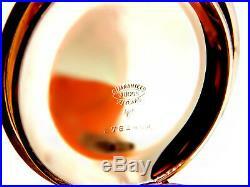 The seller is “ticker-ticker” and is located in Chatham, New Jersey. This item can be shipped worldwide.